Our reflective dog collar will safeguard your pet's life, every animal deserves the right to be seen and In-Sight™. My original design meant to keep my Great Dane safe and in sight was created out of necessity. Now, over a decade later, we've made numerous improvements and have shipped our life safety collars to dog lovers worldwide. With the re launch of all about Great Danes mobile friendly website and to serve all breeds BIG to small, all reflective dog collar orders are now taken at our jZ Canine website. Please follow links to jZ Canine for additional info and to place an order. Also, I've included more info on inspiration for these collars below the order links.. for those who may be interested. Go straight to jZ Canine Order Page to purchase an In-Sight™ Pet Life Safety Collar. Get in touch by visiting our Contact Us page located in the top navigation menu and send me an email or give me a call any time. History of our reflective dog collar design.. This true story actually inspired me to create our pet safety collars and is a testament to the importance of a reflective dog collar and increased pet visibility. John was a friend of mine, a middle age gentleman who was quite fit and an avid jogger. One night, while finishing his evening run, John was spotted by his neighbor's Golden Retriever. The youthful, energetic pup was a friend to everyone, a wonderful canine good citizen who would typically run up the cul de sac and say hello to his skin friends as they passed. This was nothing out of the ordinary! However, on this particular evening, as the Golden ran up in its usual fashion to say hello, he was struck and killed by an oncoming vehicle. I'm told it was like slow motion and to this day, John still feels horrible for the accident. The driver, for whatever reason, this particular evening, stated, "I just didn't see him!". Every animal deserves the right to be seen! All too often I'm driving at night and barely spot a roaming animal until it's almost too late! Our In-Sight™ collar shines like a star and could save your beloved pets life, I'm not kidding. For the half second it takes to put on, I don't know why every pet doesn't own one. Built with 500-Denier "double folded" Nylon, our dog safety collars are durable! This fabric is lite weight, quick to dry and tough. Our reflective dog collar is custom sized to your dogs unique measurements and designed to ride lower on the neck, it will not interfere with your current leather, nylon, prong or slip collar. We actually used the yellow collar pictured below for a 1/2-hour game of "tug of war" with big Bruiser to test durability and it did not fall apart! A quick press with an iron at medium heat and it looks good as new! Their is no need to pay double, or triple, for a standard style collar with reflective material. The problem is that when dog safety collars are used as primary collars, they're typically worn 24/7 and the reflective material becomes worn, dull, or even falls off! 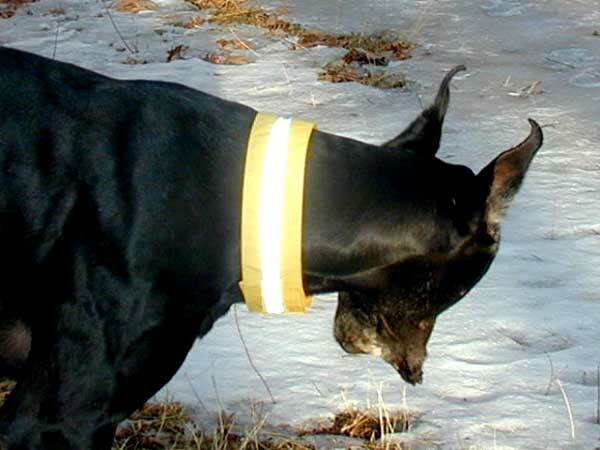 aaGD's reflective collars our intended for safety, not restraint, or walking your pet on lead. They are meant to work in conjunction with the primary collars you already own to maximize visibility and increase over all safety of your pet. Yes I have owned OTHER collars sold by other manufacturers at pet stores and elsewhere. Problem is, most other designs use a fire tape with thin reflective strip glued in place. Unfortunately, after only a few months of use the reflective strip begins to peel off! OTHER manufacturers refer to their reflective material as "industrial grade", or, "prismatic", similar to material used for road construction "safety vests". Fact is you really don't know what you're getting and I can bet you it's not 3M™ Scotchlite™! aaGD.com collars, are 100% top stitch sewn with professional grade, heavy weight, German made, Gutermann polyester thread. This reflective dog collar will not fall apart! A wide, 2-inch industrial strength Velcro™ closure allows easy, quick, half second removal. 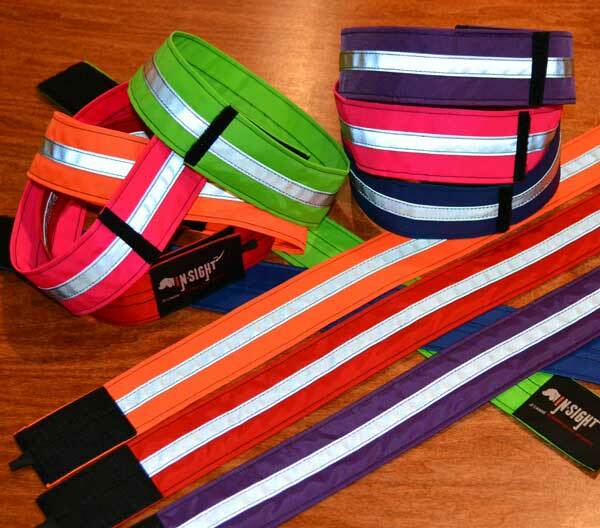 Our dog safety collar employs a genuine 3M™ Scotchlite™ #8910 retro reflective safety stripe. A 1-inch wide length of 3M™ fabric is first machine folded, then "top stitch" sewn to the double folded 500-Denier Nylon. New 2015 colors all available @ jZ Canine for immediate order. Visit our Contact Us page located in the top navigation menu and send me an email or give me at (508) 538-1150.